Alot of people tell me — “Jon, you don’t appear to do any work, so how can you tell us how to make money?” Well — the answer is that I actually do work, and I do quite well on the financial side. 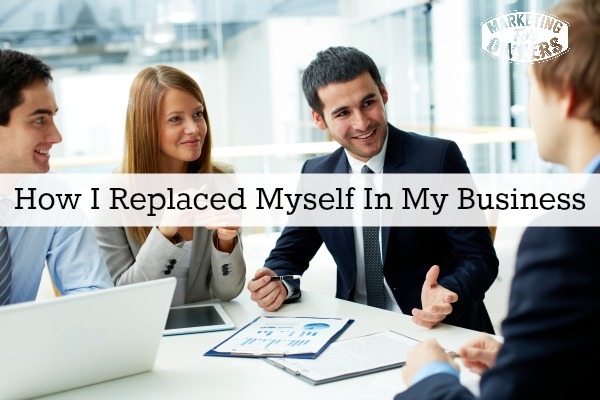 But the reason I can do well, and the reason I can do the podcasts and basically do what I want and travel to different places in the country is because I replaced myself in my business. Now this was an absolute effort and it all came from reading the E-Myth book. When I read through that, it was already good, but then I came across a section that explained about the organizational chart and demonstrates it with a drawing. What the author said is that you should think ahead about your strategic objective, where you want to be in X amount of time. For instance, where do you want to be in the year 2020? What will your business look like then? How many staff will you have? So you would work out all the positions you would have to have to achieve that goal. At the time after reading that book, I had to work out things like finance, production, marketing, people in the packing portion, bookkeeper, etc — I wrote down all these positions and mapped out an organizational chart — which helped me get to this point. But right now, you are fulfilling all of these roles because you do not have a dedicated employee list. Just like you, I was all of those things on that chart, and my job was to gradually replace myself. So for instance, if I did a bit of the packaging, I then made sure I hired someone to do the packaging and move myself out of that one. Every single job that I had in my business, I gradually replaced myself. Now I might add, that this took place over a long period of time. You cannot hire them all tomorrow, unless you have loads of money or you are using someone else’s money. So — I just gradually replaced myself and this even meant right up to management. So if I had a couple of people in the warehouse, I became their supervisor. If I had a customer service rep in my office, I became the supervisor of what they were doing as well. Then I hired someone to become my supervisor which allowed me to move myself out of the office, so that they were left to be independent. Then I was the manager, and I gradually replaced myself as the manager. And now my job is pretty much the visionary of my companies (kind of like Dan Sullivan), which is very nice because Dan is a Strategic Coach who makes something like $100 million a year or something like that. My job is to guide the business and to empower the people that work there and be able to reach my goals on my behalf. I make them their goals as well. But they are the ones left to do it. I don’t interfere much, I just guide. So when I find a new shiny idea, I will talk to them about it and explain why it’s a good idea and then let them run with it and see how they handle it. If they don’t like it, we don’t do it. If I think it is particularly good, we might try it again. Just the other day I was talking to Sue, who by the way, started out as a CSM rep in my business, but now she runs the whole operation, but I was talking to her and introduced her to SLACK. A lot of people use it so I was telling her about it. I told her how everyone was using it and how they could not live without it and that she needed to give it a try. It was free so why not? I don’t have the time to use it, but she did and I love giving my employees tools to empower people by giving them the freedom to try things like that and give them the position. We also don’t have annual appraisals. We talk to our employees once a week, every couple of weeks, or every three weeks — but we talk to them often. We have one on one meetings that last about 15 minutes with a little agenda, to stay on track. Those meetings are pretty formal, but they are not to reprimand the employees, but we use this time to talk and it gets rid of any problems that might have come about. Just the other day, Sue mentioned that there was a potential clash between a couple of people who had different personalities with someone new, so the supervisors of those two people will talk to them and explain what we are worried about and resolve the problem before it becomes one. I don’t have to get involved, we don’t have any disciplinary problems, we don’t have any staff issues — we have company culture. It’s all because I replaced myself with people who are suitable for the task. Think about it because it really works. Now in my marketing business, I don’t do much of the work. I’m very busy because we are building a business, however I have a team in place and the are the ones that I spend all my time helping them get better at their job — but without instructing them and telling them where they are going wrong. What they are doing is good enough for now and if they want to make it better, then I can help with some suggestions. Then they run with it, they make it better, it’s as simple as that. If you want to learn more, simply join the Owners Club — it’s completely free and there is no risk at all. You just subscribe and if you don’t like it — simply unsubscribe. You will get access to a lot of stuff that no one else can see such as reports, cheat sheets, and all of these things are available to you and to no one else. Today is Thursday and that means it is time for a podcast recommendation. Today I am going to share with you about a podcast that is kind of like mine. They run about 10 minutes long. 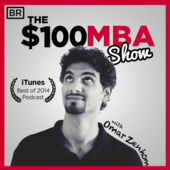 The podcast is The $100 MBA Show. It is hosted by Omar Zenhom. He does it with his partner Nicole, and they do it on camera and everything. He is a super fun guy to listen to. He does his podcast 7 days a week. He does question and answer sessions and has been doing this a lot longer than I have. The podcast is based off of his website, where you pay $100 for a one hour course that teaches you all you need to know about running your business. Go check it out and check out his website as well. His show was one of the best Itunes shows of 2014. If that is the case, it can’t be bad eh? What can you delegate to someone else?